New Delhi : A three-day global "LED Expo 2018" gets underway on Thursday at Greater Noida, organisers Messe Frankfurt said on Wednesday. At the curtain raiser to announce the 19th edition of the event, Noida Authority Chairman and Chief Executive Alok Tandon said the city Noida authorities are making progress in replacing all 74,000 traditional lights in the jurisdiction with smart light-emitting diode (LED) streetlights. Over 300 companies are slated to take part in LED Expo 2018 including from leading overseas manufacturers like China, Finland, Japan, Hong Kong, Italy, Korea, Turkey and Taiwan, a statement said. "The government is committed to promote LED lighting technologies, with Noida itself making a headway for replacing all 74,000 traditional lights with LED streetlights which are energy-saving, cost-efficient, environmental-friendly and can help us save various other costs," he said. 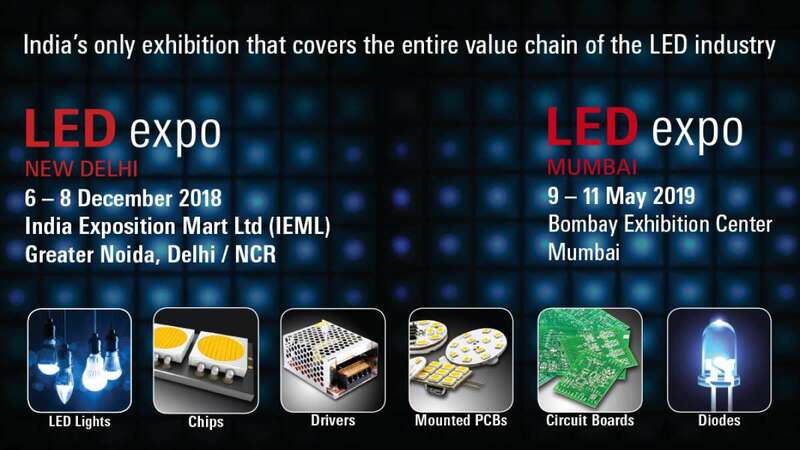 Union Electronics Secretary Ajay Sawhney said manufacturing of LED products in the country increased from Rs 2,172 crore in 2014-15 to Rs 9,630 crore in 2017-18 showing an over four-fold rise in the total production.